Space-saving and stylish, these Compression Nesting Tables need to be in YOUR nest! The construction of these tables is as straight-forward as it gets and can be easily done in an evening. And who doesn’t absolutely love transforming furniture? As with all of our plans, you are building at your own risk and you should have a firm understanding of building in general before you attempt many of our plans (others are super duper easy and perfect for beginners, like this one). With that, go forth, have fun, take lots of pictures and share them in a showcase on the site or on social media with the hashtag #builtTDCtuff and we will share our faves! 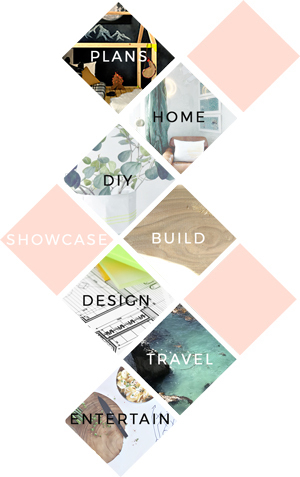 Be sure to tag @thedesignconfidential on Instagram and @thedesconf on twitter so we are sure to notice! Cut the pieces for the Large Table Top and Sides. With the Kreg jig set for 3/4” material, drill pocket holes in the top ends of the Large Table Sides. Assemble as shown with glue and 1-1/4” pocket screws. Apply edge banding to front edge of pieces if desired. Cut the piece for the Large Table Back. With the Kreg jig set for 3/4” material, drill pocket holes in the both ends and on the top side of the Large Table Back. Assemble as shown with glue and 1-1/4” pocket screws. Cut the pieces for the Small Table Top and Sides. With the Kreg jig set for 3/4” material, drill pocket holes in the top ends of the Small Table Sides. Assemble as shown with glue and 1-1/4” pocket screws. Apply edge banding to front edge of pieces if desired. Cut the piece for the Small Table Back. With the Kreg jig set for 3/4” material, drill pocket holes in the both ends and on the top side of the Small Table Back. Assemble as shown with glue and 1-1/4” pocket screws. Attach small casters to the bottom of these two tables for even more versatility!